Students observe photography of Unity models displayed at a gallery night at the Noyes Cultural Arts Center. The event was held by Unity Charity Fashion Show and NU Active Minds to support the removal of negative mental health stigmas. 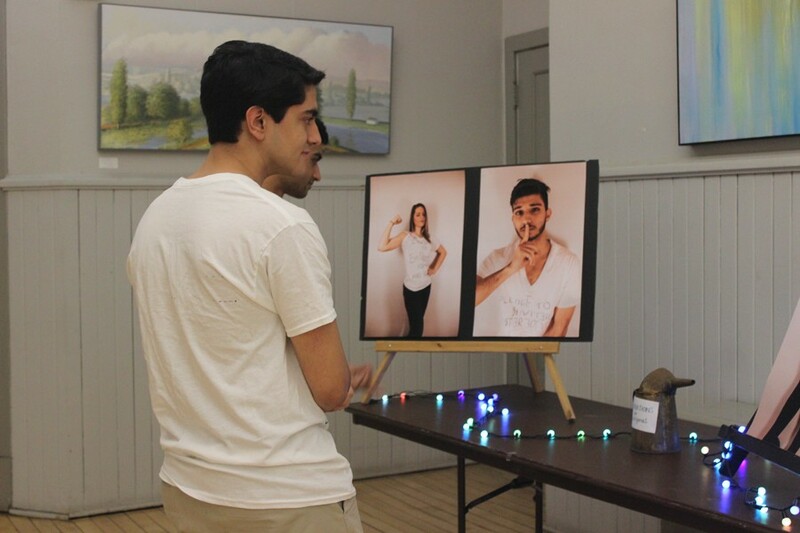 The people donning the T-shirts are Unity Charity Fashion Show models, who partnered with NU Active Minds for a gallery night Wednesday to talk about the importance of eliminating negative stigmas around mental health. The event was part of Stress Less Week, a week of activities hosted by NU Active Minds. It featured a gallery of photos of the models wearing these T-shirts, as well as musicians from Sheridan Road Records, two student speakers and a dialogue with the founder of NoStigmas, a Chicago-based global peer support network devoted to reducing stigmas around mental health. “It’s cool, it’s like the intersection of art and mental health, which is really interesting,” said Weinberg senior Sarah Moss, co-president of Active Minds. Each model was asked to decorate a white t-shirt with a mental health-related slogan and the hashtag “#nostigmas” and then participate in a photoshoot to display during the event. Photographer and Weinberg senior Shiven Samant said he asked each of the models to act out the message on the shirt in the photos. Halfway through the event, people gathered as the speakers began sharing their stories about experiences with mental illness and mental health. The first speaker was Weinberg-Bienen senior Jacob Pope, who told the audience about his battle with depression. He emphasized the importance of creating an atmosphere of empathy and compassion surrounding mental illness. He said events like this are critical to helping create this environment at Northwestern. NoStigmas founder Jacob Moore also spoke at the event, but in a discussion format. After discussing his struggles with mental health in high school, he led a brainstorming session about ways people can reduce distance in their relationships and be intentional and genuine in the way they connect with people. These type of events are important because they help remove negative stigmas related to seeking help, Pope said.